100% workout booster. 0% chemicals. Your beach body will outlast the beach season! 70% nutrition, 30% training. Too many numbers? Not anymore. In collaboration with Mintra Mattison, a former U.S. army coach, our food scientists have cracked the fitness code. 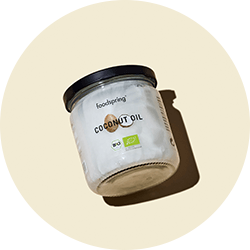 They have developed a formula to suit your hectic lifestyle: Premium proteins, healthy fats and superfoods. For breakfast, as a snack alternative between meals, and for an extra boost for sports. The perfect companion on your way to your dream body and higher self-confidence. 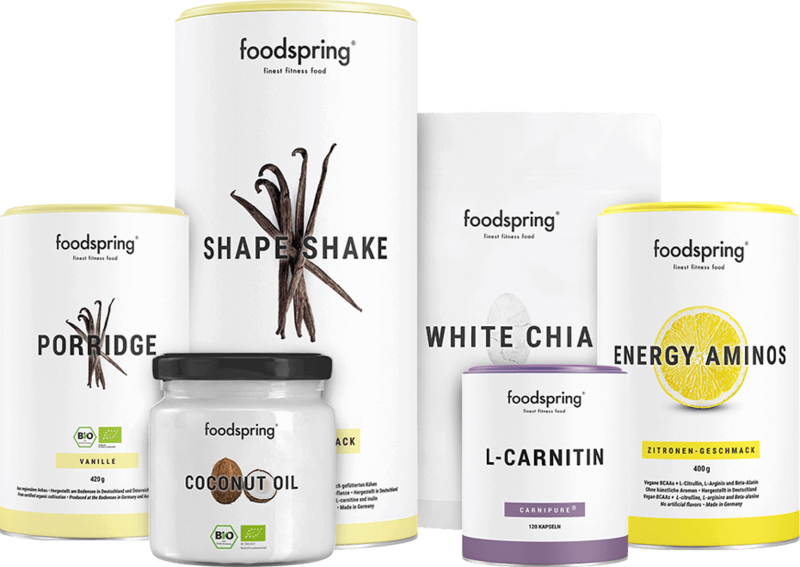 All that with foodspring’s usual premium quality. "A balanced diet and exercise are essential for achieving your dream body – a starvation diet, on the other hand – is counter-productive. This pack will help you to change your attitude to food long-term." "Many weight-loss programmes fail in daily life. This weight-loss pack has everything covered: Proteins for breakfast, snacks and shakes between meals, and a real boost for your body shaping workout." "I love how versatile Shape Shake is. The protein powder tastes great as a shake, stirred into quark or in pancakes as a substitute for flour!" What you eat determines your looks. We'll make it simple for you. High-protein shake as a supplement alongside your nutrition plan and as a workout booster. Whey protein made from the milk of pasture-raised cows. More power for body shaping exercises. The all-in-one superfood for smoothies, desserts, salads and more. The natural multi-talent for your healthy kitchen. And radiantly beautiful skin and hair. The clean pre-workout drink that gets you physically and mentally ready to train. Zesty lemon, free from artificial flavourings. The protein kick to start your day. Great to satisfy cravings between meals. How we will get the best out of you, together. Training. Diet. Motivation. These are the three pillars on which you build your dream body. We’ve all been there: New beginnings are hard. Do you want to know more about where and how to get started? Or how to best fit your workout and diet into your busy day? Our athletes and food scientists will be happy to help. Personalised advice – completely free of charge. Hand-picked coconuts from fair trade. Organic soy, farm-fresh from Lake Constance. 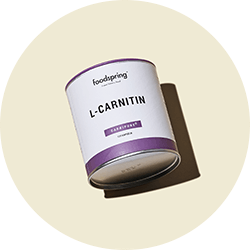 Powder mix containing whey protein, calcium caseinate, inulin, and L-carnitine for the preparation of protein drinks. Contains sweetener. 1 Calories and nutritional values will differ when a base other than water is used. It is important to maintain a varied and balanced diet and a healthy lifestyle. May contain traces of gluten, chicken protein, and soy. Dietary supplements are no substitute for a balanced and varied diet and a healthy lifestyle. The recommended daily dose should not be exceeded. Keep out of reach of small children. May contain traces of gluten, egg, soy and milk (incl. lactose). A varied and balanced diet and a healthy lifestyle are essential. May contain traces of gluten, egg protein, soy and milk (incl. lactose). Do not exceed the recommended daily intake of 15 g.
Dietary supplement. Amino acid mixture with lemon flavour. Contains sweetener. Contains caffeine and guarana extract (200 mg caffeine per portion). Not recommended for kids and pregnant women. Dietary supplements are no substitute for a balanced and varied diet and a healthy lifestyle. The recommended daily dose should not be exceeded. Keep this product out of reach of small children. May contain traces of gluten, chicken protein and milk (incl. lactose). A varied and balanced diet and a healthy lifestyle are essential. Not suitable for people with allergies to the following ingredients: Soy, milk, oatmeal (gluten). May contain traces of crustaceans and celery. Die Basics, die du kennen musst. Losing weight and getting in shape is as mental as it is physical. Distractions are poison for your mental focus. That means: concentrate on individual aspects like doing your workouts properly, and making time and space to relax, away from the stress of your workday. And most importantly: Measure yourself by your achievements. Not by other people’s bodies. You need to consume 400 calories less than you expend per day to lose weight. But that is just a guide value. One thing is certain: you will never reach your goal with a starvation diet. Our Shape Guide explains exactly, how to achieve your best form intelligently and sustainable. Yes, you do need to stick to a plan to achieve your body goals. But the rewards are there, waiting for you! And it doesn’t mean you can’t enjoy food any more! Our recipe guide contains more than 120 recipe variations to make sure that you won’t get bored on your way to that perfect beach body. You’ll see: Your new lifestyle will give you power you never thought you had in you! Protein is just for boys? Not true. Protein consists of various amino acids and is the building block for all muscle tissue – yours too. In addition to a calculated daily calorie deficit, you will have to ensure that enough of the calories you do consume are protein-based. After all, subtly defined muscles are the basis for a beautiful body.That is why you should eat 1.3-1.5 g of protein per kg body weight a day during workout phases. YOUR SHAPE ROUTINE. EXPLAINED IN SIMPLE TERMS. EASIER THAN EVER. How do the ingredients of the Shape All-inclusive Pack work together? The ingredients of our Shape All-inclusive Pack are put together by athletes and nutritionists to perfectly complement each other. Shape Shake and Shape Caps are great companions on your way to that perfect beach body and give you the power you need for your workout. Let’s be honest here: you’ll never get there without exercise. You want to see results quickly – but you also want them to last. You just can’t get motivated to go to the gym? Our Energy Aminos give you BCAAs to support your muscles and the guarana and caffeine extract clear your head to focus on your workout. 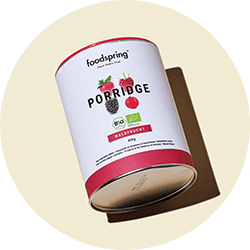 Our white chia seeds, purely natural coconut oil and organic porridge deliver valuable nutrients throughout the day. We clearly recommend physical exercise if you want to see real changes in your body. But that doesn’t mean that you have to go straight from 0 to 100. Start small. Two or three times a week for 30 minutes are plenty to start working on your dream body. Small changes in your daily routine can also make a big difference: Take the stairs instead of the lift. Get off the bus two stops early. And get started with the exercises offered in our coaching section – these you can do at home without any equipment. How is Shape Shake different from other diet shakes? Traditional diet drinks and diet formulas are designed to replace entire meals and impose severe limitations on natural eating habits. The result is a short-term success, which often followed by a yo-yo effect. Shape Shake simply supplements one meal a day until you reach your target figure. 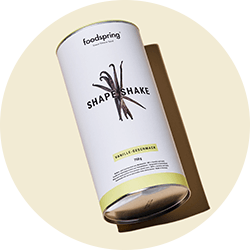 In other words: Shape Shake helps achieve long-term changes in eating habits and therefore works on the causes of problem areas. How can I save a few calories every day? Calorie counting is no fun at all. It is, however, important to consume 400 kcal less each day than you expend. Why? Imagine a sand dune; every day, the wind blows away a little bit of sand off the top. Adding the same amount of sand as is blown away each day will keep the dune at its original size despite the wind. Adding less sand than is blown away each day will make the dune shrink over time. The very same principle can be applied to calories. If you give your body less calories than it needs to do its job each day, it will start using up stored body fat. Protein is the basic building block for muscles. Muscles consist mainly of protein. It is therefore very important that you eat enough of it in your diet. We recommend 1.4 g per kilogram of body weight per day. The same applies if you don’t want to build muscle and only want to lose weight. Doing exercise while consuming less calories in your diet than you expend may cause your body to draw energy from protein – in other words: it will start breaking down muscle tissue as its source of protein. The result is what we call the “skinny fat” look: a skinny body with fat deposits and no muscles, instead of a slender, well-defined shape. What are Energy Aminos and how do I use them correctly? Try our Energy Aminos if you want to go all out at the gym but sometimes just can’t get motivated: a zesty, lemon-flavoured BCAA workout drink made with pure ingredients and without artificial flavouring or colourants. Instead, it is packed full with caffeine from the guarana plant for that extra workout boost. BCAAs are the three essential amino acids: leucine, isoleucine and valine. These cannot be produced by the human body. You should combine multiple sources of protein to supply your muscles with the amino acids it needs. Drinking a shake and some of our Energy Aminos right before your workout will help supply your body with the BCAAs it needs. Shape All-inclusive Pack will be back in stock shortly.